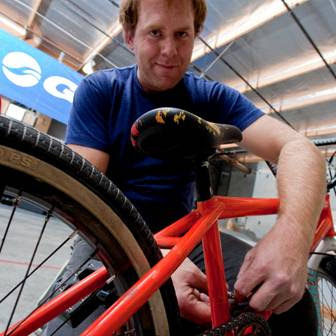 One of Giant’s newest Athlete Ambassadors is BMX pro Taj Mihelich. He’s featured in a couple of online interviews, where he talks about his new sponsor. You can read the interviews at BicycleUnion and BMXUnion. Recently, Taj got a chance to ride the BMX Park at Giant’s corporate HQ with Giant pros Kurt Sorge, Heath Pinter, Chris Arriaga, and Jeff Lenosky. After discovering that his Giant Method Team suffered pinched brake cable housing somewhere in transit between Austin, TX, and LAX, Taj made a quick field repair and got back on course.